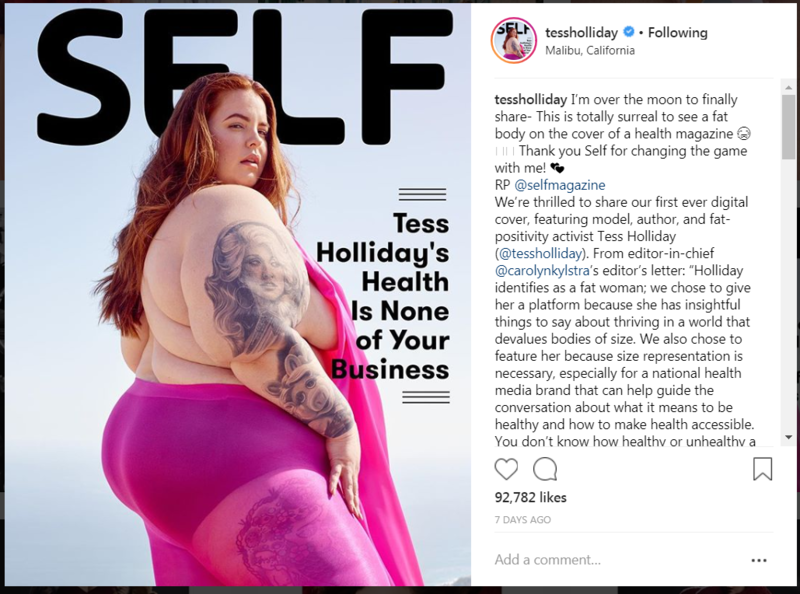 If you follow my Twitter (@lauracipullo), you may have caught my tweet about Tess Holliday, a plus-sized model, who was in a recent issue of SELF. It wasn’t so long ago that plus-sized women were nowhere to be found in SELF or any such magazine, and for one to be on the cover (even a digital cover) is still rare. If you’re not into fashion, this may all seem superficial, but it bears noting these images really do make a difference. A Florida State University study discovered that it helped women in their twenties who were concerned about their weight to see pictures of larger women; it made a positive impact on their mental health. When young women don’t get to see a variety of body types in the media, they may think something’s wrong with their body. Representation not only normalizes all kinds of bodies, it can also reassure. In the interview, both the author and Holliday shared their experiences with concern trolls. Concern trolls are people who ask after your health when you are of a certain size. Writer Ashley C. Ford said she shared pictures of her and her fiancé on social media and someone questioned whether they were healthy. Holliday said when she was pregnant people said terrible things about her and her baby. Trolling happens because “there’s a freedom of speech without a fear of consequences,” as psychiatrist Alan Manevitz, M.D., explained in a Health Magazine article about the subject. People who are not familiar with the Health at Every Size movement may make an uninformed connection between what you weigh and your health, even if they know nothing about your health. And you may feel the need to tell them that in fact you’re healthy, you’ve been to the doctor, you’ve had all the right tests, etc. etc. But guess what? You don’t have to! Your health is nobody’s business but your doctor’s, your family’s, and your own. (And if your doctor is making negative comments about your body, that’s another form of abuse you don’t have to take. Ask friends if they know of body-positive doctors you can see, or do some online research.) Tess encourages plus-sized women not to engage with folks who ask or comment about health: “By telling people that you see a doctor, and telling people that you’re healthy, it’s perpetuating the abuse against bigger bodies and the mindset that we owe it to people to be healthy,” she told SELF. So how do you handle it when someone questions your health on a post or a “well-meaning” relative says something about your size? Body-positive influencer Katie Knowles tells Mic she doesn’t play into their hands. She’ll block, report if needed, ignore, and keep it “classy, which they clearly aren’t being.” (Blocking is something I also recommend in my guide to creating a body-positive social feed.) Shay Neary, another body-positive influencer, says in that Mic article, “Sometimes I even choose to go educational, but that route only works for the ones willing to listen.” That is definitely something you can do, whether the harassment is happening on or offline. Turn a negative moment around into a teaching one. 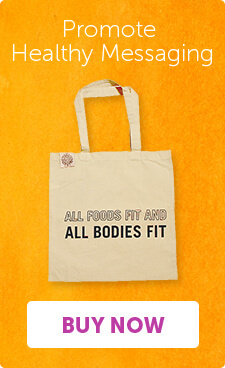 The Health at Every Size community has so many great resources you can point someone to. You can also let them know that being “overweight” has actually been proven to be affiliated with less mortality from all causes on the whole. Yo-yo dieting is also unhealthy, and wanting to get thin by any means necessary is the perfect set-up for an eating disorder, which can have a traumatic effect on your health and even be fatal. I hope you will never have to deal with someone who feels the need to “share their two cents’ worth” about your size, but chances are, you will. It’s an unfortunate consequence of the world we live in. Even though there are beacons of body positivity like Holliday, we still live in a less than fully body-positive world. Educate if you feel like it’s worth it and you have the emotional energy, but more importantly, take care of yourself – and this means go offline if you need to. But I also hope you’ll come back when you’re ready. We need your voice – and all body-positive voices — now more than ever. Laura Cipullo's Practice has been recognized as one of the top New York Dietetics practices. Laura provides sound, ethical nutrition advice to both adults and children. She is available for private, one-on-one consultations, family nutrition sessions or meetings with groups of peers. © 2019 Laura Cipullo Whole Nutrition Services. All Rights Reserved. Subscribe now to empower a Lifestyle of Positive Nutrition!